I have written one article few days back for loading relational data in SQL Server from XML file. I got very good response from that article so I am tempted write another one on XML. Suppose you have different occurrences of data within same level of XML file, how would you query or populate in SQL Server? Let us have a look at it. –how would you list employee with all concern department? 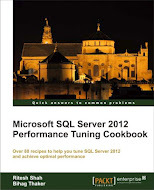 This entry was posted in Uncategorized and tagged load XML into SQL, Microsoft, MS SQL Server 2005, ms sql server 2008, query XML file, Ritesh Shah, T-sql, xml on June 6, 2009 by Riteshshah.